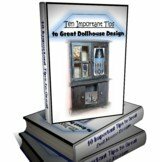 Many times by the simple act of browsing through the numerous doll house and miniature resources available both online and off a person can kindle the desire to create their own world in mini. Most books a person encounters will help the novice as well as the expert to achieve amazing results. to Master Great Woodwork Techniques? If your have four vital pieces of equipment inside of yourself, you can conquer any woodworking technique you encounter. These four attributes are: Interest, enthusiasm, patience and determination. And plenty of all four. Without patience, enthusiasm, determination or interest most dollshouse craft projects would possibly just get chucked in a corner somewhere unfinished. So add these valuable resources to your list of must-haves before you begin crafting anything in this line. As well do not let anyone tell you, you have to be a cabinet maker or anything close to it either to achieve great dollhouses or miniature pieces. If miniature artists and writers of dollshouse books can do it so can you. Never lose hope in who you are. Yes all it takes is that you begin. Without a start we are all sunk. So learn to get off to a great start and you will succeed in your skillful techniques pursuit. Your workshop area need only be a table top in your home until you find you need something more substantial. When beginning you should find you really need only a basic set of tools for your woodworking techniques to achieve great results. So come along on the adventure of miniature doll house creation and watch as you become better and better at what you do in mini.